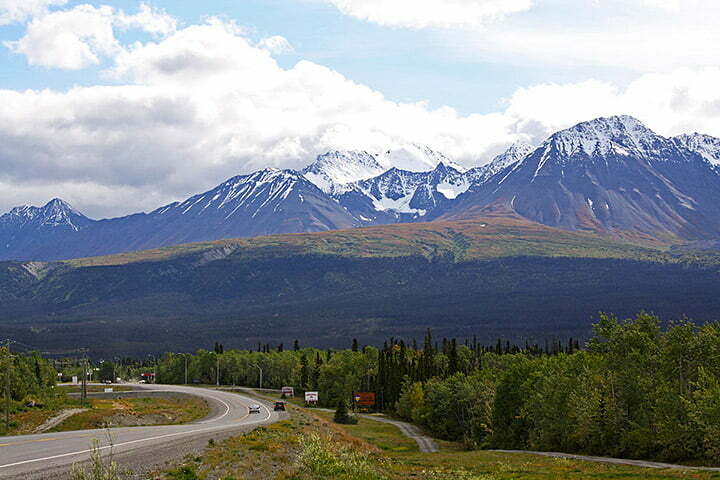 The Haines Highway (still called the "Haines Road" by locals) connects Haines Junction, Yukon to Haines, Alaska. The road follows a traditional route used by the Chilkat Tlingit traders and later the prospectors of the Klondike Gold Rush, winding along the Chilkat River coming from Haines before ascending the Chilkat Pass and meandering along the edge of the scenic St. Elias mountain range. The well-maintained road is about 244 km (152 mi) long and crosses the U.S.-Canadian border. No services are offered along this stretch of road, so make sure you have enough gas and supplies. A pullout on the west side of the road overlooks the beautiful Alsek mountain range and the Tatshenshini River, which was designated a Canadian Heritage River in 2005. Panels explain early exploration in the area. A large pullout on the west side of the road overlooks two small wetlands. A dozen or so Trumpeter Swans regularly spend the summer here. A few kilometres further north along the highway, you will pass a beautiful marsh on the west side of the road. A pullout on the east side of the road provides access to Kathleen River. There are panels explaining fish use.